Another somewhat belated review! I picked up the PowerMonkey Explorer at Glastonbury when multiple battery fails left me without any means to charge my phone (and everyone elses!). As an emergency charger the Powermonkey does a good job, you charge the powemonkey (from the mains, solar panel or by USB from your laptop) and then connect it to the gadget using the right "tip". If there isn't a tip you can use the regular USB cable the gadget came with or buy more tips online from the powemonkey website. This all works well, the battery will charge a dumb phone around 2/3 times or a smartphone one and a half times (for the technically minded the capacity is 2200mAh). The solar panel is useful but this will only charge the powemonkey to around a third of its capacity each full day of sunlight. This won't keep a power hungary iPhone on full juice away from the mains forever but it is a useful topup and of course free! It's also worth noting that you can't (for some reason) charge the powermonkey from the mains and a gadget from the powemonkey at the same time. However what really turns this package from being useful to being brilliant is how flexible it is. 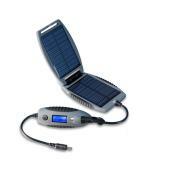 All of the supplied "bits" - the powermonkey, solar panel, mains charger and USB lead work with the tips so it is completely flexible. For example you can use a Mini USB tip on the mains charger whilst using the powemonkey to charge an iPod touch. Low powered phones can even be attached direct to the solar panel! You can also use the USB cable this way and there are additional tips available at quite a cheap price. All this means you can leave pretty much all your other chargers and cables at home and take the powermonkey, mains charger and bag of tips (including USB cable) for day to day use bringing the solar panel when say going camping. I paid £50 for this and it is good value for money and feels and looks solid. Highly recommended for fellow gagget addicts!